Inexplicably and when it seems completely impossible, somehow- God can and will give you strength. Strength to take care of what needs to be taken care of. Strength to make the hard decisions. Strength to hold onto hope. Strength to hold onto Him. I know that many of you are facing situations that are draining your strength and leaving you feeling powerless. It is okay to admit you are not okay. That you are tired and feel powerless right now. God does not ask you to “fake it until you make it”. 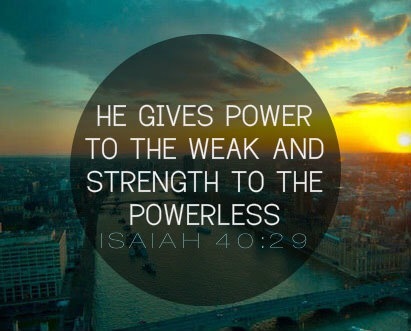 What do you need strength for today? What does it look like to admit you need help rather than “fake it until you make it”? May you find the strength to do what needs to be done,find your way into His rest, be replenished by the Savior Himself and walk forward in a power that is not your own.